Hitchcock worked with several actors and actresses more than once. The actor who worked with him the most was character actor Leo G. Carroll appeared in six Hitchcock movies. Directors have favourite actors and actresses whom they cast time and time again. 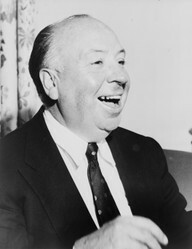 Alfred Hitchcock had a list of favourites who appeared in several of his films. Character actor Leo G. Carroll had important roles in six Hitchcock films and his roles were varied, showing he was a versatile actor. Hitchcock loved to cast his favourite stars in multiple films. Ingrid Bergman. Cary Grant. Grace Kelly. James Stewart. They all starred in multiple films with the Master of Suspense. If you look at the list of actors who appeared in two of Hitch's films, the names include Joan Fontane, Gregory Peck, and Farley Granger. Who appeared in more Hitchcock films than any other? Among women, there is a character actress who rarely had any lines and often didn't have an official character name other than "Juror" in Hitchcock's British career. However, since Hitchcock would use the same people-including himself-to create crowd scenes, that is not surprising. If we ignore extras and focus on people with speaking roles in Hitchcock's films, who has appeared with the Master of Suspense the most often? How many of you want to say that Cary Grant and Jimmy Stewart are tied for first place, with a total of four each? Well, you are wrong. Although Grant and Stewart starred in more Hitch films than any other *leading* actor, character actor Leo. G. Carroll starred in six. He is one of those famous nameless faces that you see pop up in dozens of classic films in a variety of roles-villains, good guys, and curious characters. And the spectram of Carroll's Hitchcock characters reflects this. Without giving away any spoilers to anyone who has never seen these films, he has portrayed a member of the law, the criminal, a spy, a doctor and several characters who had nothing to do with the solution of the crime at all-regardless of his profession. Carroll plays Dr. Baker, the doctor of the late Rebecca DeWinter. He appears near the end of the movie. Carroll plays Dr. Murchison, the head of the hospital where Ingrid Bergman works and Gregory Peck is one of her patients. Peck has amnesia and is suspected of murder. Carroll is convinced Peck is guilty. I have some more hubs that I haven't switched to Wizzley yet. I've been off doing other things, but I want to move the hubs that are still usable before choir rehearsals start again in the middle of September. I have always loved writing about Hitchcock and I can see me focusing on his films if I wrote new articles. Justin-Yes, it is nice to know that young people like we are love Hitchcock films and are keeping his films with a young audience that we will be there to introduce even younger people to Mr. Hitchcock. Well-I don't have children, but you do. :)Thanks for the compliment and the share. very enjoyable read, Flora. Nicely done. Nice to know there are young folks like u and I keeping the genius of Hitchcock alive. Voted, shared, etc. Katie- I'm glad you enjoyed this write-up of Hitch and Carroll. When I first saw Carroll, I didn't realize he was in so many films but he kept showing up and I soon learned that he cuold take over my attention away from the lead actors. Any time an actor can take away my attention from one of my favourites, he quickly becomes one of my favourites himself. Carroll finally moved from character actor in the movies to TV star and became a household name on Topper. Deservedly so. Hitchcock is an amazing and creative genius, what a delight to read how he collaborated with Leo. G. Carroll and all the many greats. What a line up.